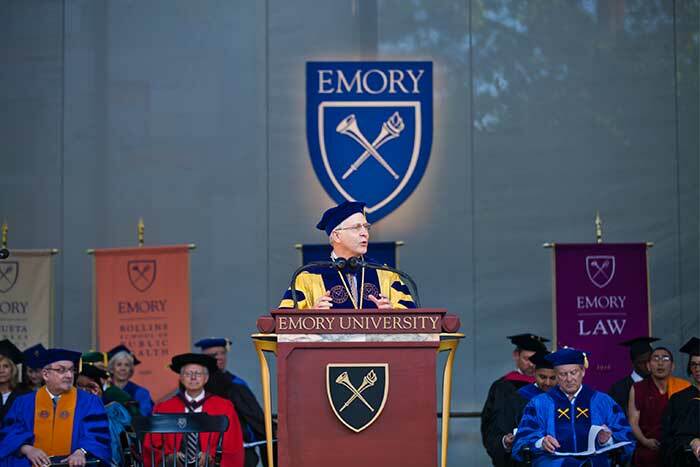 Emory's graduation exercises began Monday, May 11, at 8 a.m. on the Emory Quadrangle. 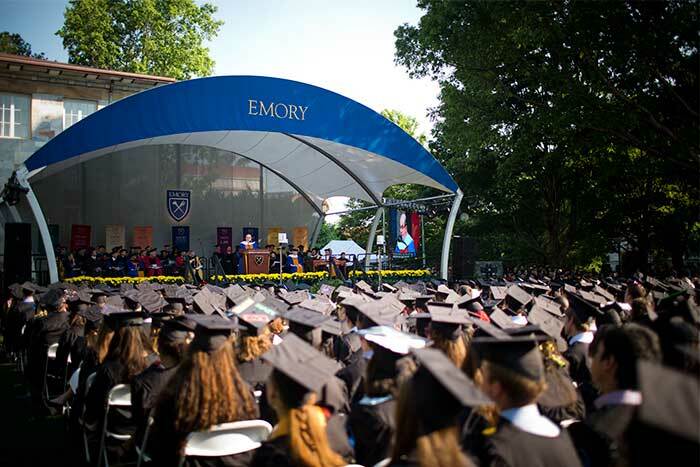 Nearly 4,500 graduates gathered on the Emory Quadrangle. 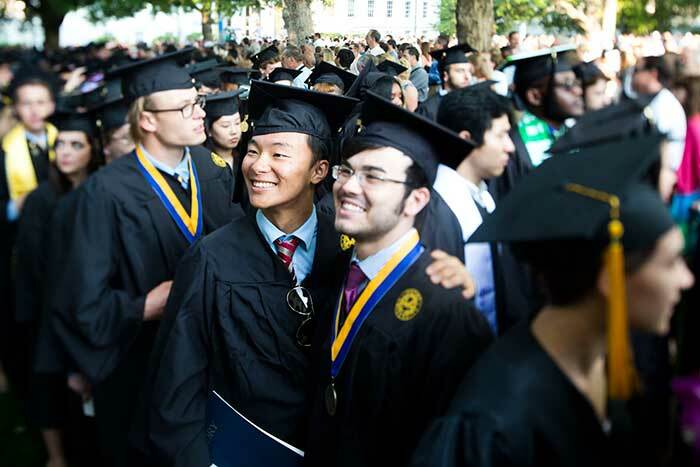 The class of 2015 entered the fall when Emory celebrated its 175th anniversary, and leaves as the university celebrates its 100th anniversary in Atlanta this year. Emory University President James Wagner acknowledged the unique composition of the graduating class — 57 percent are women, 43 percent men — who represent nearly every state in the United States and some 78 countries. President Wagner said the Class of 2015 "has demonstrated the possibility of living the paradox of humble boldness, or bold humility." Acclaimed author Salman Rushdie gave the keynote address, an end to his tenure as University Distinguished Professor in Emory College of Arts and Sciences. Amanda Gean Garcia-Williams was presented the Marion Luther Brittain Service Award, the university’s highest student award for service and leadership. 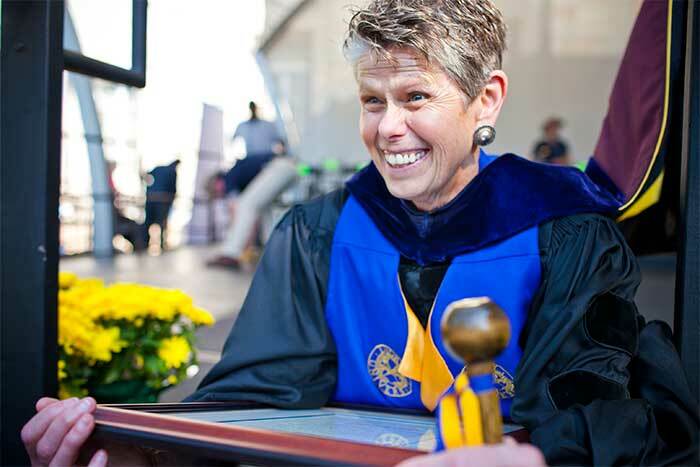 The Thomas Jefferson Award for service went to Bobbi Patterson, professor of pedagogy in the religion department in Emory College of Arts and Sciences and associate director of graduate studies in Laney Graduate School's graduate division of religion. Thomas Long, Bandy Professor of Preaching in the Candler School of Theology, earned the United Methodist Church University Scholar/Teacher Award. 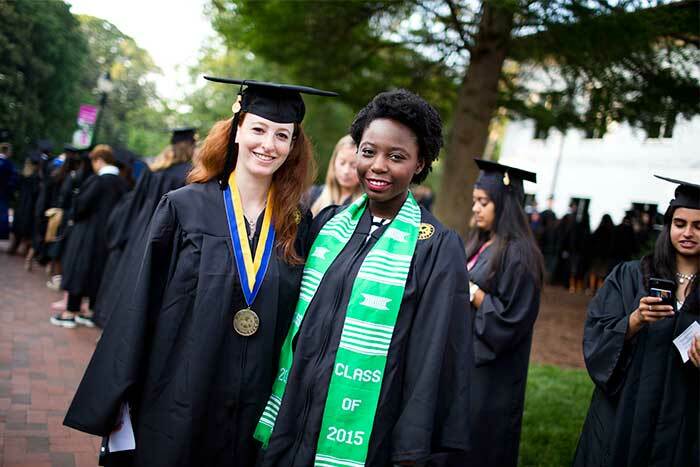 Emory's 170th Commencement, held Monday, May 11, celebrated the diverse achievements of the Class of 2015, from academic excellence to compassionate community service. 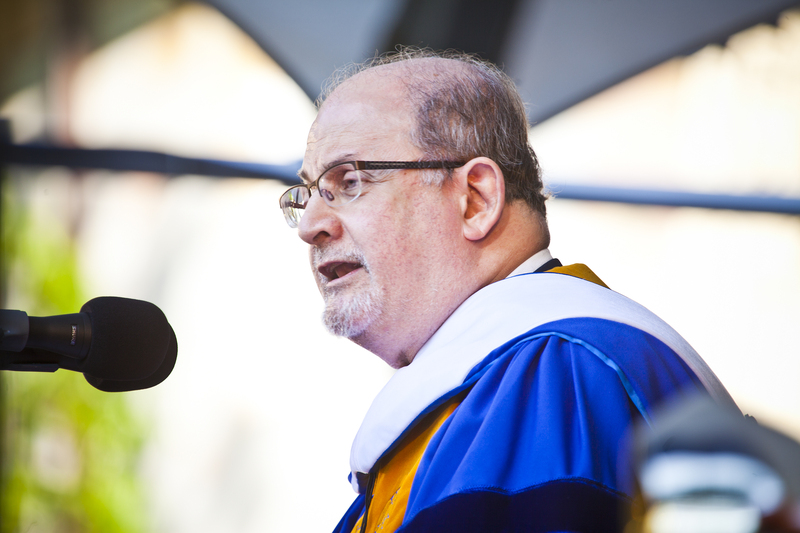 Acclaimed author Salman Rushdie urged Emory's Class of 2015 to whet an appetite for the challenges before them and, using the intellectual tools provided by their liberal arts education, to "go out there and swallow the world." "Make no mistake, you can change things," he said. "Don't believe anyone who tells you that you can't." Presenting the keynote address at the university's 170th Commencement ceremony on Monday, May 11, Rushdie advised graduates to be skeptical, question everything, use their imaginations, speak their minds and strive for something beyond simply seeking happiness in life. "Because, there it is, out there, the grand and appalling human reality — its elation, its despondency, its danger, its dentistry," Rushdie said in a speech filled with both wisdom and wit. "Be greedy for it. Grab great handfuls of it and stuff it in your pockets, your mouths, or wherever you most like stuffing things." Rushdie acknowledged something in common with the nearly 4,500 graduates who gathered on the sun-dappled Emory Quadrangle on a day that was literally bathed in university colors, as golden morning light spread under clear blue skies. "I'm leaving Emory today, too," noted Rushdie, who recently concluded his role as University Distinguished Professor in Emory College of Arts and Sciences. The award-winning author's relationship with Emory began when he delivered the 2004 Richard Ellmann Lectures in Modern Literature. He joined Emory as a Distinguished Writer in Residence in the English Department in 2006, serving in that role until 2011, when he began his professorial role. For Rushdie, the relationship with Emory will now continue through his archive, which is housed at the university's Manuscript, Archives and Rare Book Library. 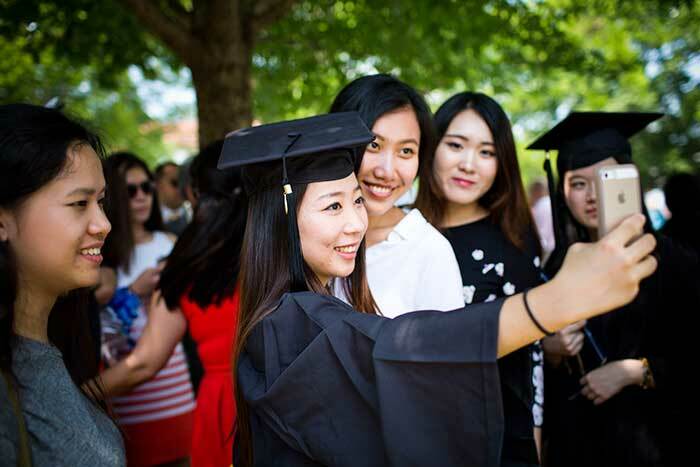 "Emory has been good to me, and I hope you think it has been good to you, too," he told the new graduates, reminiscing about time he spent during the last decade listening to music at Blind Willie's, or eating soul food at Son's Place and tacos on Buford Highway. "I hope you're hungry, because it's time to go out there and swallow the world," Rushdie advised. "That's a great big meal and you'll need a big appetite." For many graduates who gathered for the ceremony — along with a sea of family and friends — it was indeed a day of nostalgic endings and exciting new beginnings. 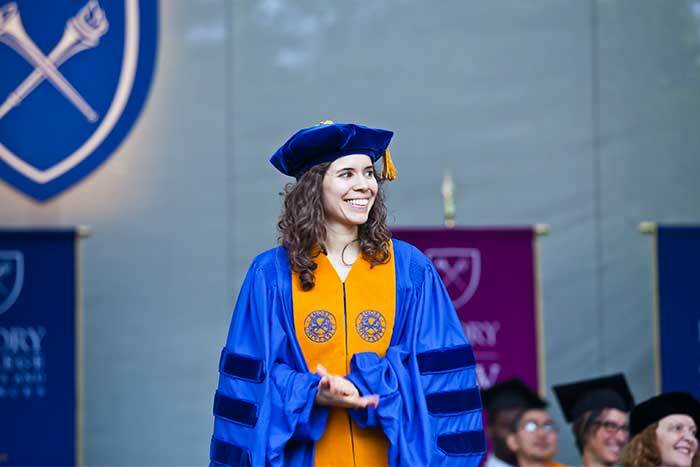 As Rachel Tobin, a biology major from Pittsburgh, prepares to begin medical school this fall, she leaves Emory with memories of strong relationships forged with faculty and new friends. "I've grown and learned so much," she said. "It's been a fabulous four years." Daniel Assan, a business administration major from Little Rock, Arkansas, has plans to work for an advertising agency in Atlanta. But as he leaves, Assan looks back with fondness on the three years he spent participating with Emory's mock-trial team. Despite future plans in medicine, Tressa Ellett, a biology major from Chicago, admitted being wistful that her Emory experience has come to an end. "It's been wonderful," she said. "I can't believe that the past four years have led to this moment — it feels like it's taken about 30 seconds." "I think Emory offered the perfect balance of academic rigor along with allowing you so many opportunities for service and a social life," says Ellett, who worked with low-income, preschool-age children as a volunteer with Jumpstart at Emory. Some feelings were universal. As Sonam Choephel marked completion of a two-year, non-degree program through the Emory-Tibet Science Initiative, he was among six Tibetan monks preparing to head back to their respective monasteries in India to share their knowledge. "I'm feeling so much excitement," Choephel said. "But at the same time, it's also scary. It's a new thing, a big thing, but also a wonderful thing." Emory University President James Wagner acknowledged the unique composition of the graduating class — 57 percent are women, 43 percent men — who represent nearly every state in the United States and 78 foreign countries. 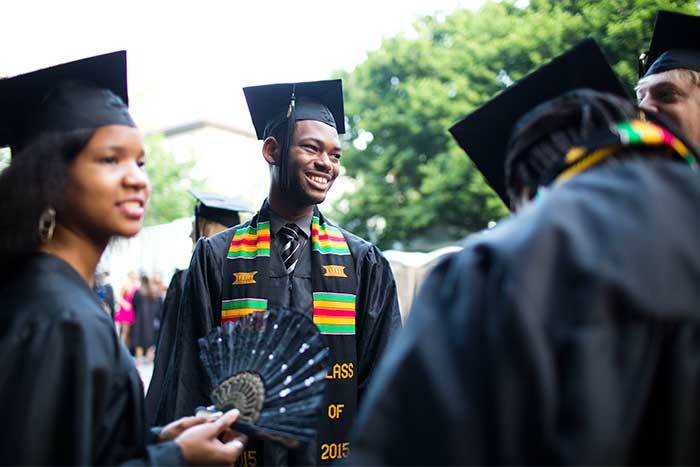 Collectively, this year's class earned 4,557 degrees and certificates, according to Commencement data provided by the Emory Registrar on Monday afternoon. However, beyond demographics, Wagner said this was a class that may be best remembered for embodying "something of a paradox." Notably, most undergraduates "have the unique distinction of having entered Emory during the fall semester when we were celebrating our 175th anniversary, and then graduating four years later as Emory is celebrating its 100th anniversary," Wagner said, the latter celebration marking Emory's "replanting" from Oxford, Georgia, to its Atlanta campus. Moreover, the Class of 2015 "has demonstrated the possibility of living the paradox of humble boldness, bold humility," he said, demonstrating a "willingness to work boldly toward noble ideals — like social justice, support for refugee communities, public health and mental health in Africa and Latin America, access to education for undocumented residents of our country, peaceful resolutions in the Middle East." At the same time, the class showed "real humility in the way that you extend forgiveness and compassion to those who falter in our shared work," he said. "You have seen that as we live and work together, that people differ in the way we strive to realize shared ideals. This kind of insight "requires a mature recognition of one's own limitations and need for help," Wagner noted. "And out of that recognition grows the real transformation of enabling and ennobling each other and our communities." As a final paradox, Wagner spoke of the fact that Emory students experience an "education steeped in both the ancient tradition and the contemporary relevance of the liberal arts." 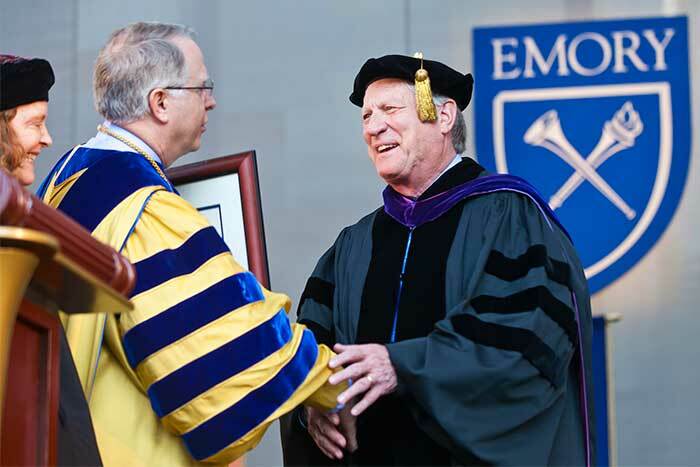 Emory graduates, he observed, not only leave campus "job-ready and highly employable," but also prepared for life, citizenship and relationship with "skills in critical thinking and creative articulation" and "advantages in character formation, the ability to thrive amid ambiguity and the capacity to appreciate and fully enjoy life." "That is part of the soul of Emory that we trust you carry with you," Wagner said. In addition, three honorary degrees were conferred, including an honorary doctor of laws degree to former Atlanta Mayor Shirley Franklin; an honorary doctor of letters degree to Billy E. Frye, Emory alumnus and former provost and chancellor; and honorary doctor of humane letters degrees to both philanthropist R. Randall Rollins and Rushdie. In concluding his remarks, Rushdie apologized to new graduates for the failures of his own generation and "for the mess we are leaving, the whole ecological, fanatical, oligarchic mess." "We thought of ourselves, my lot, as tolerant and progressive, and we are leaving you an intolerant and retrogressive world," he said. "But it's a resilient place, the world, and its beauty is still breathtaking, its potential still astonishing, and as for the mess we've made, you can change it, and I believe you're going to," he said. "We are language animals, we are dreaming creatures," Rushdie said. "So dream. Speak. Reinvent the world."